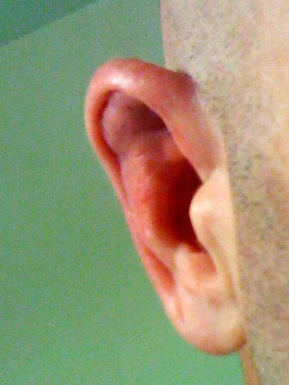 I have been training Brazilian Jiu Jitsu on and off for almost 20 years and somehow I finally was given the gift of cauliflower ear during my last training session. I actually didn’t even notice it until a couple days after when I went to shave my head. I happened to bump it and it felt puffy. I gently squeezed it and could feel it was full of fluid. It didn’t hurt at all. I figured I would make an attempt to get rid of it. I didn’t want end up like one of those fighters that looks like he has used bubble gum attached to the side of his head for ears. Before I share with you what worked for me, understand I am not a doctor, and, if you try my process you are doing so at your own risk! 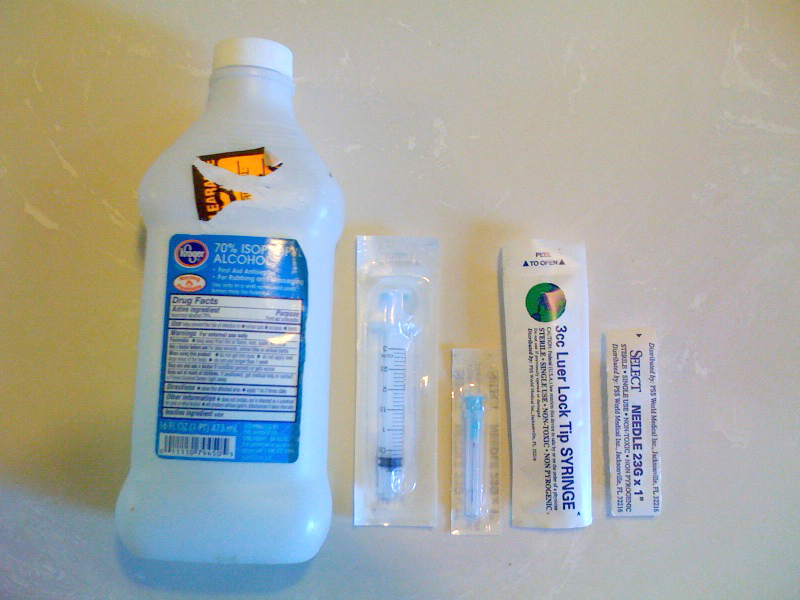 You will need rubbing alcohol or hydrogen peroxide to sterilize your ear before and after the process and a new sealed 3cc syringe and a new sealed 23g x 1″ needle. A roll of gauze or something similar is also needed. One of the guys at the gym I train at is a diabetic. I explained my situation and I was lucky enough to obtain a syringe and needle from him. I know this might not be an option for some of you, but if you ask around, you might get lucky like I did. Remember, always use a brand new sealed needle and syringe and never share needles. Don’t be an idiot! It is important to insert the needle at the correct angle and depth. Don’t just stick it in the juiciest part and start sucking away at it. You won’t be successful removing all the fluid. The angle above is how to inserted the needle. 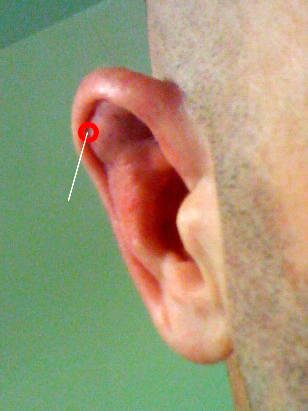 I actually laid the needle against my ear and then changed the angle just enough so that the tip of the needle stuck and then I pushed it in about 1/16 an 1/8 of an inch. I held the syringe in place with one hand then began to pull the plunger back. But I found that I couldn’t pull the plunger at all because the vacuum was too strong and I had not gone deep enough. I pushed it in a little further and pulled the plunger and this time I hit the mother-lode. It was just over two CCs of blood. I kept on pulling the plunger until I couldn’t get any more fluid. Think about the concept of sucking all the air out of a sandwich bag until it is completely flat. Then, I slowly pulled the needle out. Be sure to wipe the ear with rubbing alcohol or hydrogen peroxide after the process to keep your ear infection free. I was told to wrap my ear against my head with gauze tightly to keep it flat as much as possible. I didn’t have any gauze, but I did have a bandana. I folded it up to about a 3″ wide and tied it tightly around my head making sure my ear had plenty of pressure on it. I slept on it. When I woke up it had gathered a little bit of fluid in it again. I repeated the whole process and walked around for a day with a bandana. My ear looks good as new to this day and has not effected my ear modeling career a bit! Be sure to avoid training for a couple weeks or more for the best results. Otherwise, you will have to repeat the process each time you train. By the way, if you live in the Orange County California area, come by and train Brazilian jiu Jitsu with us at RocknRoll Brazilian Jiu Jitsu and Personal Training!